Cut the broccoli into bite size pieces. Fry broccoli and kale in olive oil and make sure the broccoli stems have a golden brown surface before tossing on the pan. Add the fresh spinach to the pan for the last few minutes. Fill a small pot with water and bring to the boil. Add 1 tea spoon of vinegar to the boiling water and bring to a simmer. Crack the egg in a cup. Create a whirlpool in the water by whisking in the same direction. Gently let the egg slide into the wirlpool and let simmer for about 2 minutes. Remove the egg with a skimmer. 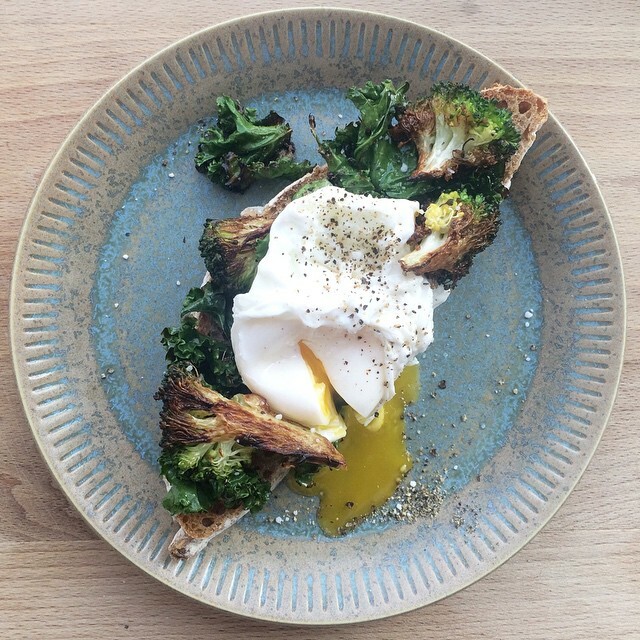 Place your veggies on the toast and add the poached egg on top with a sprinkle of salt and pepper. And now you have the pleasure of cutting your egg and letting the egg yolk run out.